From pyramids and pharaohs to tombs and Tutankhamun, unlock the secrets of ancient Egypt in this brilliant mini encyclopedia about one of the world's greatest civilizations.What was it like to be a pharaoh? Who built the pyramids, and how? How was a mummy made and why did the ancient Egyptians mummify cats? Learn how to spell your name in hieroglyphs and how to count ancient-Egyptian style. Find out about everyday life in ancient Egypt - the toys children played with, what music was popular, how people dressed, and what they ate - in this essential reference guide.With amazing encyclopedic stats, cool pictures, and incredible facts, Pocket Eyewitness Ancient Egypt takes you back in time, and is the perfect introduction to the history of ancient Egypt for young readers.From pyramids and pharaohs to tombs and Tutankhamun, unlock the secrets of ancient Egypt in this brilliant mini encyclopedia about one of the world's greatest civilizations.What was it like to be a pharaoh? Who built the pyramids, and how? How was a mummy made and why did the ancient Egyptians mummify cats? Learn how to spell your name in hieroglyphs and how to count ancient-Egyptian style. 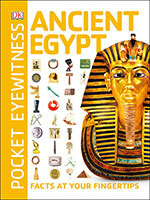 Find out about everyday life in ancient Egypt - the toys children played with, what music was popular, how people dressed, and what they ate - in this essential reference guide.With amazing encyclopedic stats, cool pictures, and incredible facts, Pocket Eyewitness Ancient Egypt takes you back in time, and is the perfect introduction to the history of ancient Egypt for young readers.